I’m standing in line at the liquor store. In one hand, I have a six-pack of Leinenkugel’s Summer Shandy. In the other, I have Short Pants Shandy from Bauhaus. The guy in front of me looks me up and down like a cartoon wolf. He doesn’t seem to like what he sees. I didn’t ask what he took issue with, but let’s assume it was the beer and not a natural aversion to dad bods. It’s not an uncommon reaction to shandy in the US. Like other sweet beers and cocktails, it’s looked down on or dismissively feminized by men. (By the way, that’s a ridiculously dumb reason to avoid something delicious.) Others give it short shrift because they view it as less than beer because it’s a mix of beer and lemonade added after the brewing process. The beer occupies a strange place in the beer world. Ask a stranger at a bar to explain what makes a lager a lager, and you’ll probably get a blank stare. Ask someone to explain shandy and you might get a scoff, but they’ll have the answer. There are relatively few commercially available shandies in the United States, yet there’s no confusion about what you’re ordering. The emergence of shandy in the United States -- it was already popular in parts of Europe -- over the last decade is in no small part due to the success of Summer Shandy. Or, in a roundabout way, the success of the 151-year-old brewery’s Berry Weiss. Now, shandy accounts for 70% of all the beer Leinenkugel's makes. The brewery secretly tested a shandy and a Kölsch at a handful of bars in Madison, Milwaukee, Chicago, and Minneapolis. “By far, the Summer Shandy was the most intriguing beer people had ever tried,” Leinenkugel said. “I think I knew very early on that we had a beer our drinkers were going to enjoy.” In retrospect, it makes sense. The shandy is a perfect summer drink. It’s light, strikes the right note on a hot day, and most varieties arrive with a sessionable ABV around 2-5%. The 10th oldest brewery in America, known throughout the Upper Midwest for its Original Lager and Honey Weiss, was transformed by the beer over the next decade. Now, shandy accounts for 70% of all the beer Leinenkugel’s makes. Since the release of Leinenkugel’s lemon brew, shandy has become a familiar style. It’s a summer staple for breweries like Narragansett or the Traveler Beer Company, which only makes variations on the shandy. It’s a fast ascension for a beer that is a relatively new creation, especially for a beer concocted in Germany. Franz Kugler introduced the beer at his Deisenhofen tavern just outside Munich. At the end of a race in 1922, his establishment was set upon by thousands of thirsty cyclists. When he realized he might not have enough beer to sate the masses, he began cutting the beer with a clear lemonade soda he had trouble selling. And the radler, which translates to “cyclist,” was born. 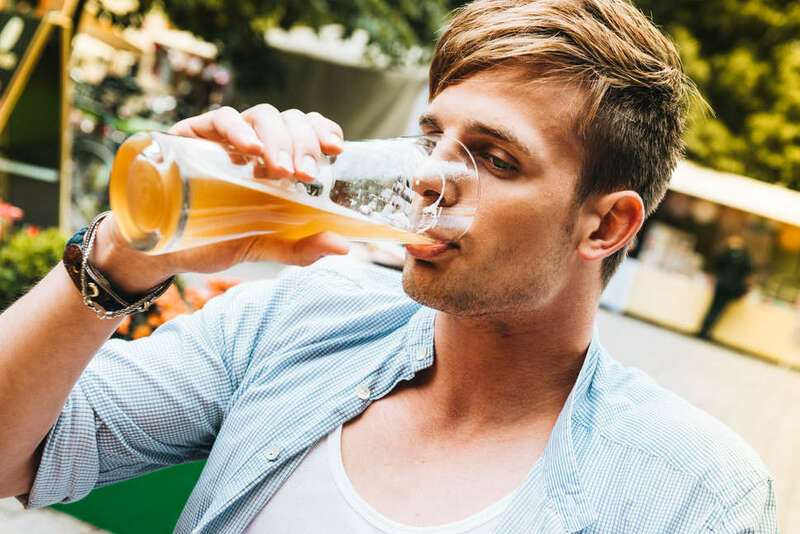 Today, radler and shandy are used almost interchangeably in the United States, even though the differences between them once held some importance. The beer didn’t sweep across the US as a summer BBQ must-have until the arrival of Summer Shandy. Now, it would seem, life has handed every US brewery lemons and they’re making lemonade shandy. However, Summer Shandy remains the gold standard. Leinenkugel says nine of 10 shandies consumed in the US have Leinenkugel’s on the label. It wouldn't have taken hold in Germany if it wasn't good. It may have been novel at one point, but there are lots of shandies and radlers capable of proving, even to a bearded barrel-aged drinking beer snob, that shandy can be a solid go-to. Here are a few beers that can convert the staunchest anti-shandite. Narragansett hooked up with Del’s Frozen Lemonade in 2014 to create this refreshing carnival in a can. Del’s is on the sweet side, but it doesn’t have that artificial lemon taste that veers toward Pine-Sol. It’s not malty, so if you’re looking for a shandy that retains strong beer flavors, this isn’t for you. If the sweetness is too much, Curious Traveler Shandy has similar characteristics in a much subtler beer. Shady Spot doesn’t exude a fresh-squeezed lemon vibe, but it has a nice balance. It still tastes like beer without giving up its refreshing qualities. It’s a nice entry-level shandy if you’re unsure about whether you want to be seen drinking one in public. The same can be said of Susquehanna’s Sunny Spot, which is the grapefruit version of Shady Spot. Others: Bauhaus Short Pants Shandy, Sam Adams Porch Rocker. If you prefer a little grapefruit in your shandy, you’re in luck. There are lots. You probably won’t find one better than Hoppin’ Frog’s Grapefruit Turbo Shandy. It’s malty so you don’t feel like you’re drinking soda, and it has the taste of real grapefruit, slightly bitter, and not too sweet. Unlike its sugary brethren, you can put a few of these back without feeling like you’re going to pay for it tomorrow. You can find shandy flavors veering off in strange, fruity directions. Traveler offers pineapple and strawberry varieties. You’ll find pumpkin shandy in the fall. However, Lancaster’s Blue Trail -- a blueberry shandy -- is genuinely a great summer beer. It retains some great malty characteristics with a tartness that almost drinks like a sour. Boulevard gets credit for making a radler that stands out as something unique and delicious. It retains the refreshing summery vibe of a shandy while adding the surprising kick of fresh ginger.